With Notopia, Psychonautilus delivers the second EP within a fortnight that’s part of a trilogy out this spring on GiveUsYourGOLD. Psychonautilus is the sonic research vessel of Thomas Tichai, one half of the creative duo behind GiveUsYourGOLD and label staple Psycho & Plastic. As the titular neologism implies, Notopia is the exploration of a barren and monochrome world with sonic means. Across three tracks, the EP continues the journey of its precursor Metastability. 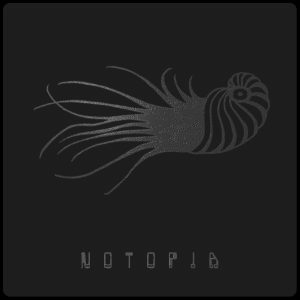 The opener “Notopia” throws us in at the deep end, with swaths of noise and cold analogue synths interspersed with pitched down vocals and occasional bits of field recordings. This is a hollowed out void in which angst and despair seem to be the only remaining emotions. “Hierophantiasis” is a brutalist composition with a dragging 5/4 beat, over which the circuit boards in Psychonautilus’ electronic sound generators are chatting away in a post-human language. Silky synth tones and a jangly guitar about half way through provide an anchor of life and keep listeners from drifting too far off into the abstract and abrasive world depicted here. “Dysphoria” picks up the pace with a manic take on dark techno moods and ambient noises. The declaration “you really should have been here in your dreams” makes it clear that reality is always more grim than imagination. However, the break in the middle section delivers much needed catharsis as our sunken submarine suddenly surfaces and the first traces of light appear in the periscope. The follow up EP and final instalment in the trilogy, Oneiromania, will revolve around this silver lining.